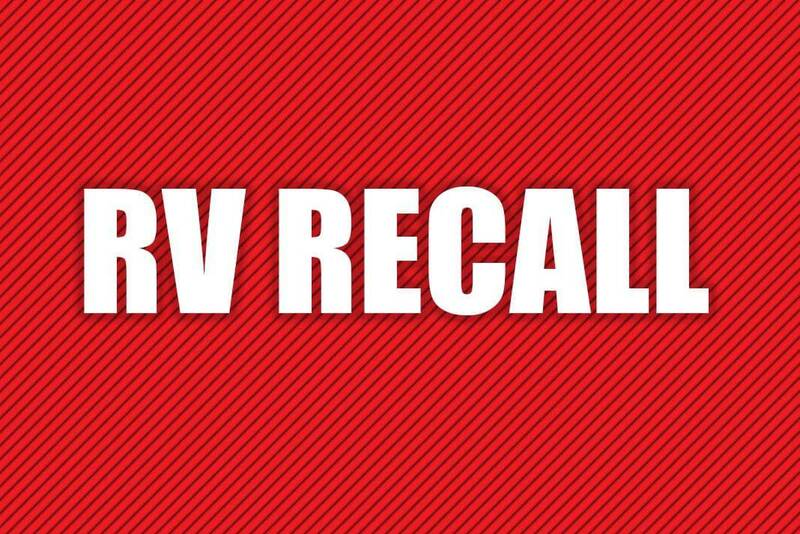 Here is our monthly summary of RV recalls for December 2018 and related equipment we feel are of interest to our readers. This information has been gleaned from the U.S. National Highway Transportation Safety Administration. PLEASE NOTE: Due to the partial federal government shutdown, this listing of recalls is shorter than usual, and reflects only the information available prior to the shutdown. This is NOT a complete list of all vehicles and related equipment recalled. Grand Design RV, LLC (Grand Design) is recalling certain 2019 Grand Design Imagine recreational trailers, built on D28H, D35, D40 or D44 trailer axles. The inner hub bearings may not have been sufficiently greased, which can cause the bearings to overheat and fail. If the bearings overheat, the hub may fail, affecting handling and increasing the risk of a crash. Grand Design will notify owners, and dealers will inspect and repair the hubs and bearings, as necessary, free of charge. The recall was expected to begin December 19, 2018. Owners may contact Grand Design customer service at 1-574-825-9679. Grand Design’s number for this recall is 910018. Gulf Stream Coach, Inc. (Gulf Stream) is recalling certain 2019 Gulf Stream Vintage Cruiser recreational trailers. The inner hub bearings may not have been sufficiently greased, which can cause the bearings to overheat and fail. If the bearings overheat, the hub may fail, affecting handling and increasing the risk of a crash. Gulf Stream will notify owners, and dealers will inspect and repair the hubs and bearings, as necessary, free of charge. The recall was expected to begin December 21, 2018. Owners may contact Gulf Stream customer service at 1-800-289-8787. Gulf Stream’s number for this recall is GS03122018. Heartland Recreational Vehicles, LLC (Heartland) is recalling certain 2019 Heartland Pioneer and Prowler recreational trailers, built on D28H, D35, D40 or D44 trailer axles. The inner hub bearings may not have been sufficiently greased, which can cause the bearings to overheat and fail. If the bearings overheat, the hub may fail, affecting handling and increasing the risk of a crash. Heartland will notify owners, and dealers will inspect and repair the hubs and bearings, as necessary, free of charge. The recall began December 7, 2018. Owners may contact Heartland customer service at 1-877-262-8032. Heartland’s number for this recall is 99.01.42. Jayco, Inc. (Jayco) is recalling certain 2019 Jayco White Hawk, Jay Flight SLX, and Jay Feather travel trailers. The inner wheel hub bearings may not have been sufficiently greased, which can cause the bearings to overheat and fail. If the bearings overheat, the hub may fail, affecting handling and increasing the risk of a crash. Jayco will notify owners, and dealers will inspect and repair the hubs and bearings, as necessary, free of charge. The recall was expected to begin December 21, 2018. Owners may contact Jayco customer service at 1-800-517-9137. Jayco’s number for this recall is 9901422. Keystone RV (Keystone) is recalling certain 2018-2019 Keystone Raptor recreational trailers, model 353TS. The tires may rub against the frame outrigger while being towed. Tire contact with the frame outrigger may result in tire damage and can affect vehicle handling, increasing the risk of a crash. Keystone has notified owners, and dealers will cut a notch into the frame outrigger that will provide clearance between the frame and tire, free of charge. The recall began November 20, 2018. Owners may contact Keystone customer service at 1-866-425-4369. Keystone’s number for this recall is 18-339. Keystone RV Company (Keystone) is recalling certain 2019 Keystone Cougar, Outback, Passport, Springdale, Bullet and Hideout recreational trailers and 2019 Dutchmen Aerolite and Atlas recreational trailers. The inner hub bearings of the axles may not have been sufficiently greased, which can cause the bearings to overheat and fail. If the bearings overheat, the hub may fail, affecting handling and increasing the risk of a crash. Keystone will notify owners, and dealers will inspect and repair the hubs and bearings, as necessary, free of charge. The recall is expected to begin January 20, 2019. Owners may contact Keystone customer service at 1-866-425-4369. Keystone’s number for this recall is 18-340. Thor Motor Coach (TMC) is recalling certain 2017-2019 Thor Challenger, Miramar, and Outlaw motorhomes. The motorized windshield roller shade at the driver’s seating position may unroll without warning while driving. If the windshield roller shade unrolls while driving, it could block the driver’s visibility, increasing the risk of a crash. TMC will notify owners, and dealers will install a fastener to ensure the motor will not allow the shade to roll down while driving. The recall is expected to begin January 15, 2019. Owners may contact TMC customer service at 1-877-855-2867. TMC’s number for this recall is RC000165. Ford Motor Company (Ford) is recalling certain 2018 Lincoln Navigator and Ford Expedition vehicles. The second row center seat track assemblies may be missing one or both of the J-channel reinforcement brackets, possibly allowing the seat to move in the event of a crash. In the event of a crash, a seat that moves may not properly restrain the seat occupant, increasing their risk of injury. Ford will notify owners, and dealers will inspect the second row center seat for any missing J-channel reinforcement brackets, replacing the center seat frame assembly as necessary, free of charge. The recall was expected to begin December 17, 2018. Owners may contact Ford customer service at 1-866-436-7332. Ford’s number for this recall is 18S37. Ford Motor Company (Ford) is recalling certain 2019 Ford F-250 Super Duty, F-350 Super Duty and F-450 Super Duty vehicles. An incorrect transmission case casting may cause the park pawl assembly to not be secured, possibly resulting in unintended vehicle movement. Unintended vehicle movement can increase the risk of a crash. Ford will notify owners and dealers will inspect the transmission case, replacing the transmission as necessary, free of charge. The recall began December 7, 2018. Owners may contact Ford customer service at 1-866-436-7332. Ford’s number for this recall is 18S36. Ford Motor Company (Ford) is recalling certain 2019 Lincoln Nautilus vehicles that are not equipped with Adaptive Front Steering. The plastic cover on the driver frontal air bag module may detach during air bag deployment. If the air bag cover separates during deployment, it can increase the risk of injury in the event of a crash. Ford will notify owners, and dealers will replace the driver air bag module, free of charge. The recall began December 7, 2018. Owners may contact Ford customer service at 1-866-436-7332. Ford’s number for this recall is 18S38. Honda (American Honda Motor Co.) is recalling certain 2019 Honda Ridgeline and Pilot vehicles. The mounting holes for the clip that secures the right center pillar trim panel may be larger than intended. In the event of a crash necessitating right side curtain air bag deployment, the clip may not hold the center pillar trim panel in position and it may potentially interfere with the curtain air bag deployment. As such, these vehicles fail to comply with the requirements of Federal Motor Vehicle Safety Standard (FMVSS) number 214, “Side Impact Protection,” and 226, “Ejection Mitigation.” In the event of a crash, if the curtain air bag does not deploy as intended, it can increase the risk of injury. Honda will notify owners, and dealers will install a bracket on the right center pillar that will securely hold the center pillar trim clip, free of charge. The recall is expected to begin January 25, 2019. Owners may contact Honda customer service at 1-888-234-2138. Honda’s number for this recall is D3D. Suzuki Motor America, Inc. (Suzuki) is recalling certain 2012-2013 Suzuki SX4 vehicles. The power steering pump may seize causing a loss of steering assist. A seizure of the power steering pump would cause a loss of power steering assist, requiring extra steering effort at lower speeds, increasing the risk of a vehicle crash.The remedy for this recall is still under development. Interim owner notification letters are expected to be mailed January 4, 2019. A second owner notification will be mailed once the remedy is available. Owners may contact Suzuki customer service at 1-800-934-0934. Suzuki’s number for this recall is CZ. This newsletter is copyright © 2019 by RVtravel.com. Thank you! For the recall segment. I know you list ways we can check ourselves, but so helpful to have your summary each month. We bought a new travel trailer in November, and saw that there was a recall on the model that month. The dealer checked for us before we picked it up- all clear- but I don’t think they knew about it before we brought it to their attention. Thank you! I’ve been reading and supporting for 2 years- and this peace of mind was certainly worth the support!